Mayor Rahm Emanuel touted academic gains made by CPS students and said Gov. Rauner needs to recognize them. PULLMAN — Mayor Rahm Emanuel on Tuesday accepted an apology made last week by Gov. Bruce Rauner for criticizing Chicago Public Schools teachers and principals, but called on him to "turn the page" and "embrace the children of the City of Chicago" by recognizing their academic gains. "I accept it," Emanuel said at a Pullman news conference Tuesday. "But I think he needs to see a couple things." Rauner apologized for a 2011 email released last week in which he said half of CPS teachers are "virtually illiterate," while calling principals "incompetent." He was not yet governor when he wrote it to other wealthy Illinoisans interested in reforming public education. Emanuel granted that those opinions dated from before Rauner was elected to the state's top post, but then cited the governor's more recent comments calling Chicago schools "crumbling prisons." Emanuel touted what he said were rising CPS graduation rates (69.9 percent) and college attendance and graduation (14 percent, up from 8 percent and close to the national average of 18 percent), as well as improving math and reading scores — bucking nationwide trends in inner-city school districts. "I would hope that the governor would now turn the page, both in calling our schools prisons and calling our teachers illiterate and principals incompetent," Emanuel said. "I want him to be the champion of the educational and academic gains the children of the City of Chicago are making. "A real governor would see the children of the City of Chicago not as the stepchildren of the state, but as people who are leading in something he should be proud of," Emanuel added. "He should hold them up as an example of what we can do if we pull together principals, parents and teachers." He urged Rauner to "embrace the children of the City of Chicago." While accepting Rauner's apology, Emanuel added that he would also like to see the governor push through pension equity with other state school districts and additional funding for poorer districts, including Chicago's. 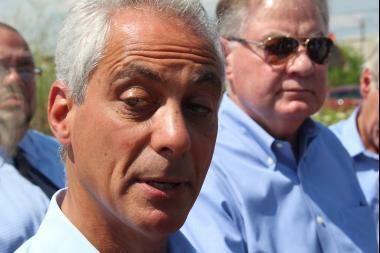 "I'm going to accept him at his word," Emanuel said. "More importantly is for the teachers" to be satisfied with Rauner's apology as well. Yet, after disrupting a Rauner news conference on Friday in response to the governor's earlier remarks, the Chicago Teachers Union did not immediately respond to requests for additional comment.